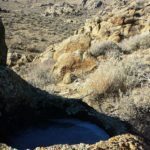 Some of the best sites are ones that people just tend to “stumble” upon. 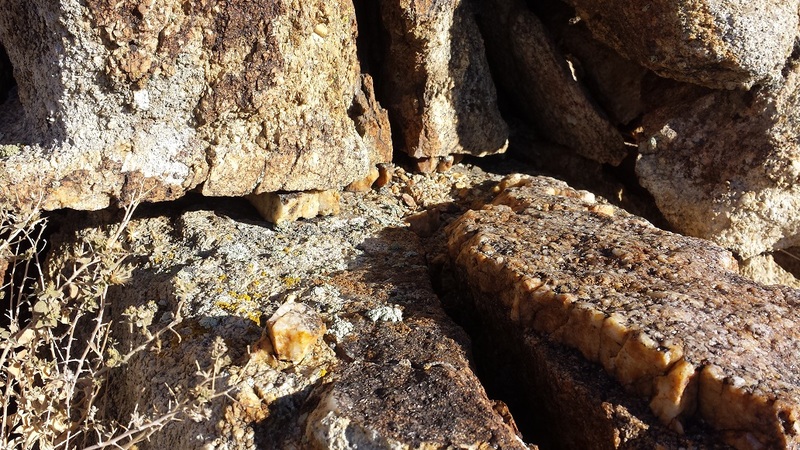 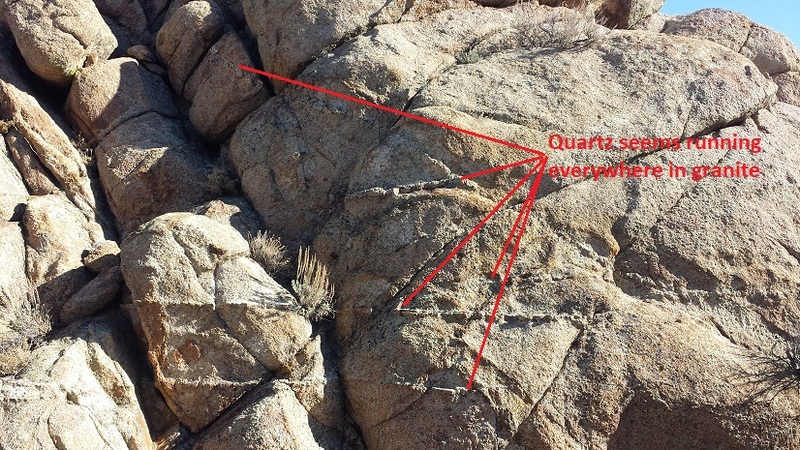 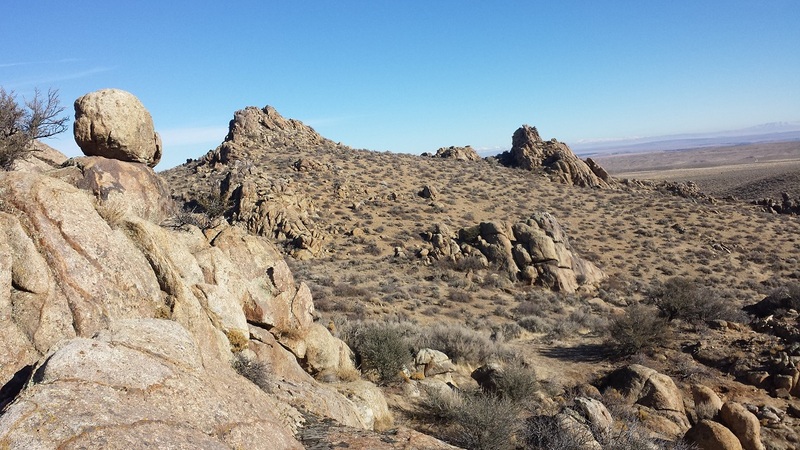 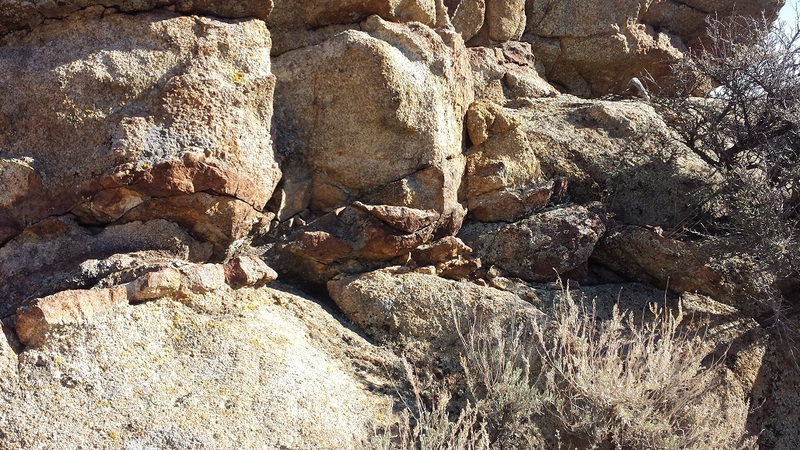 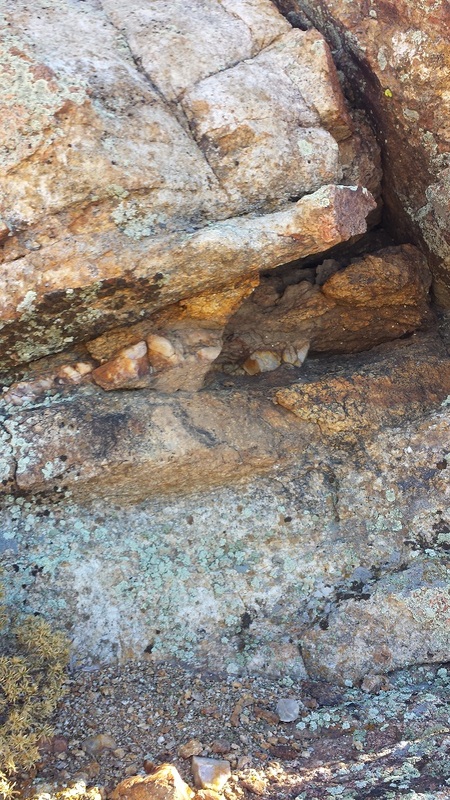 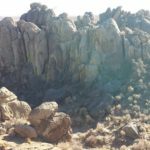 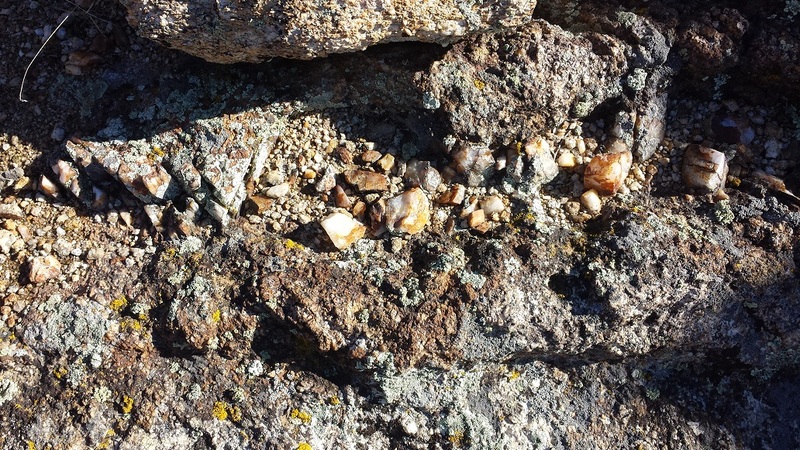 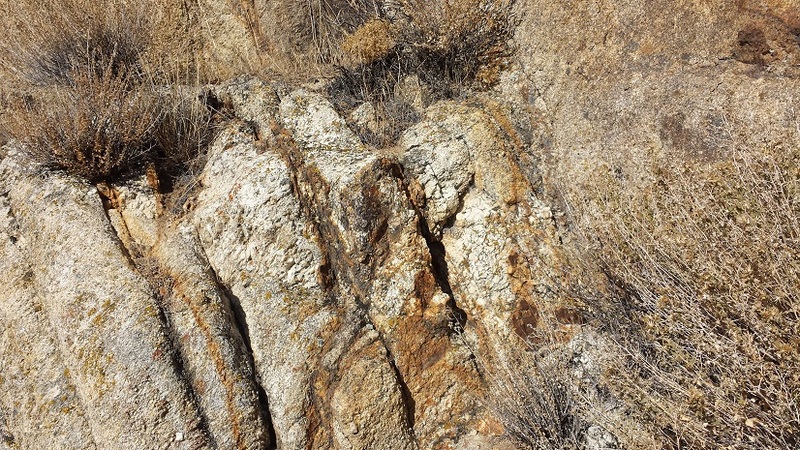 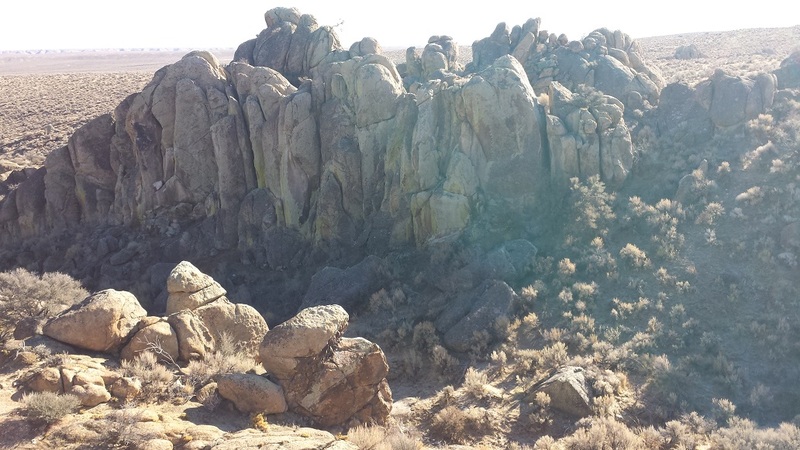 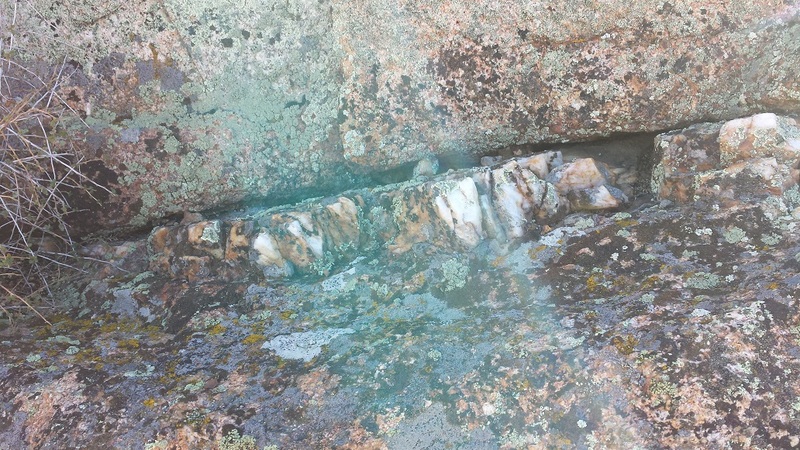 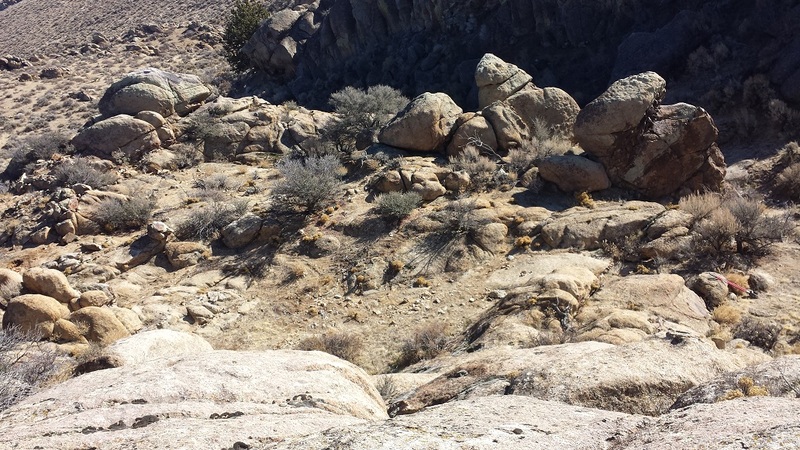 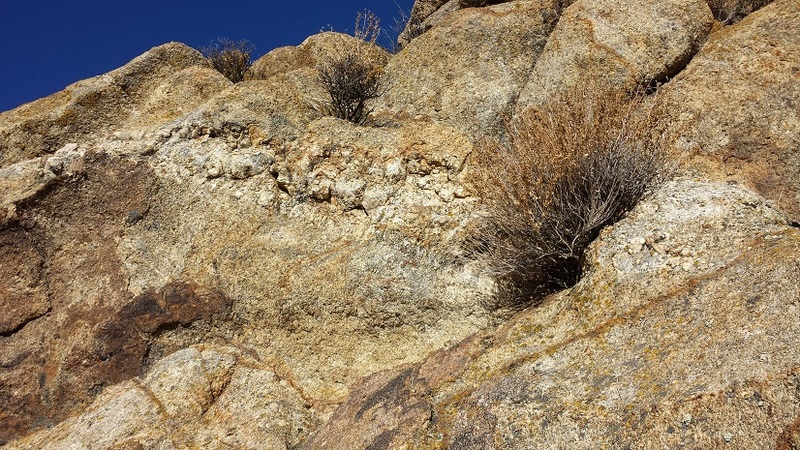 While doing some exploring, came across some impressive granite outcroppings which had quartz lining the washes. 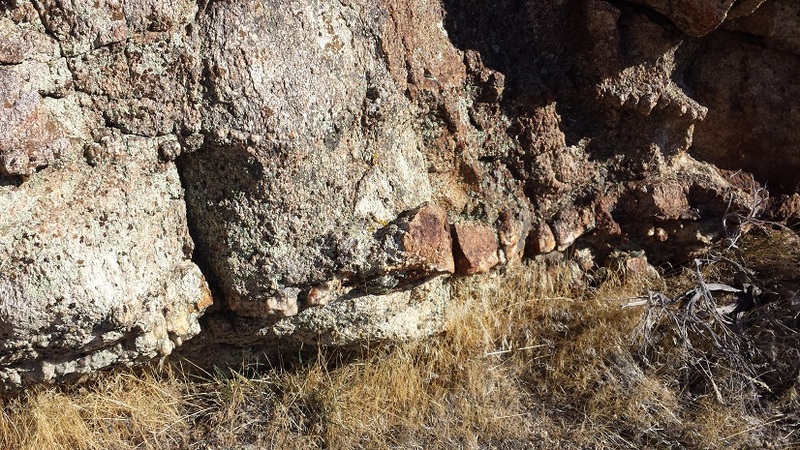 Doing some initial poking around, these outcroppings were laced with quartz veins and seems that ran all through the area. 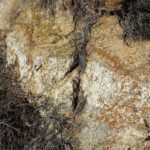 Sizes of the veins ranged from just a few inches to some larger ones 12”+ thick. 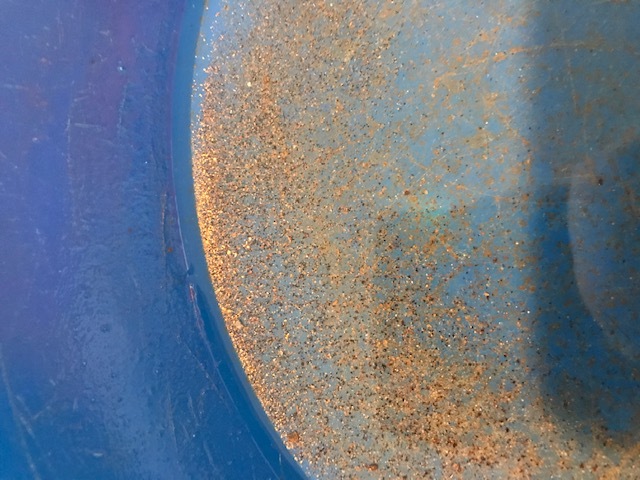 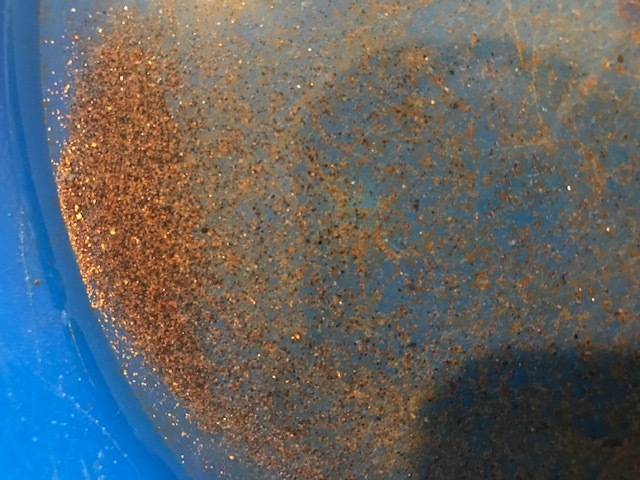 Pulled multiple samples, ran assays, and then processed (crushed and free-milled) a couple hundred pounds of ore, and found it rich with gold (see results below). 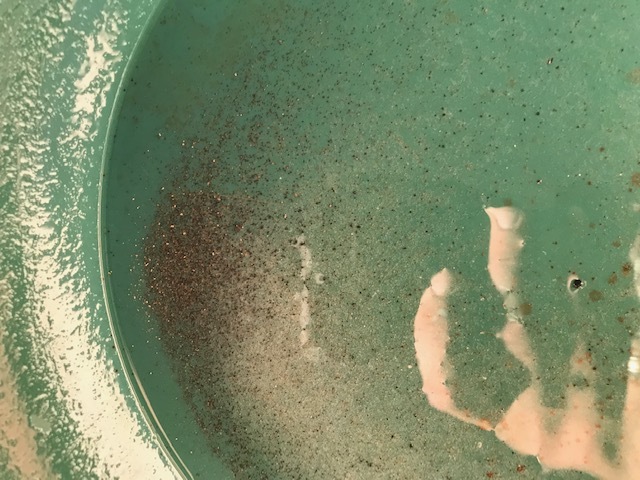 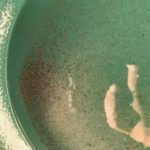 Even panning out some of the loose deposits in the washes produced nice color. 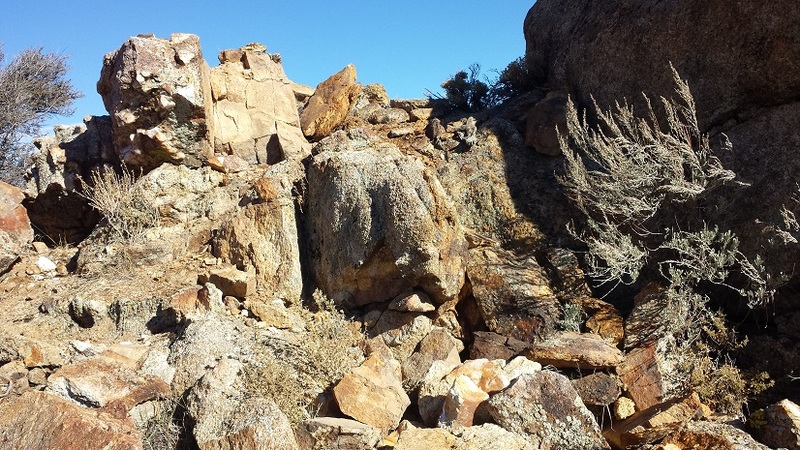 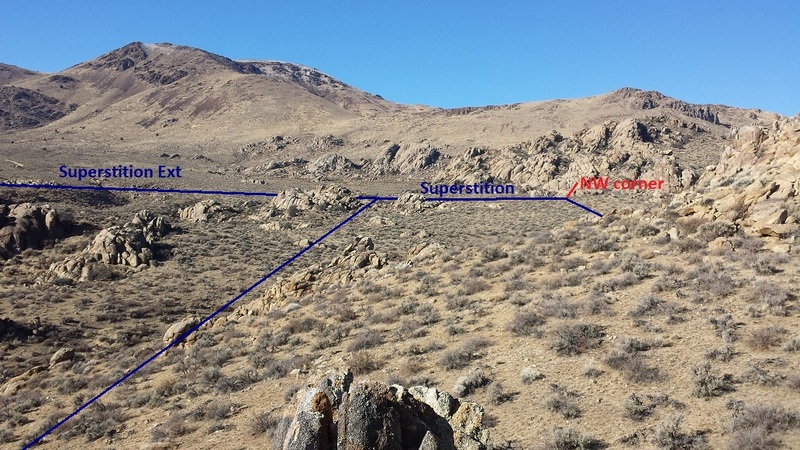 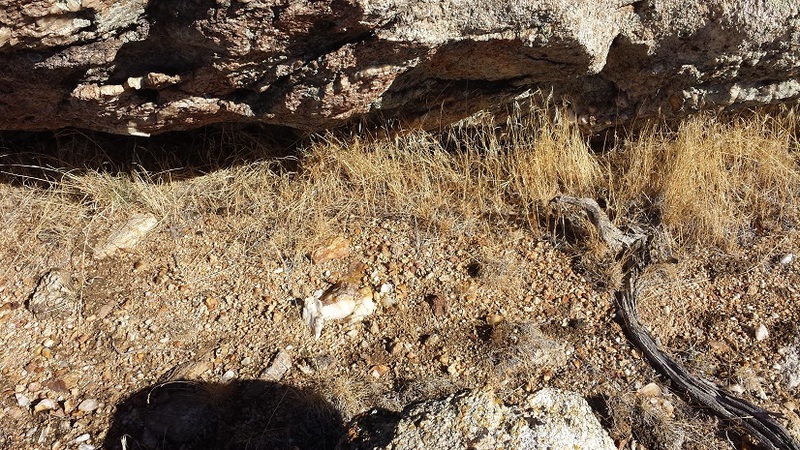 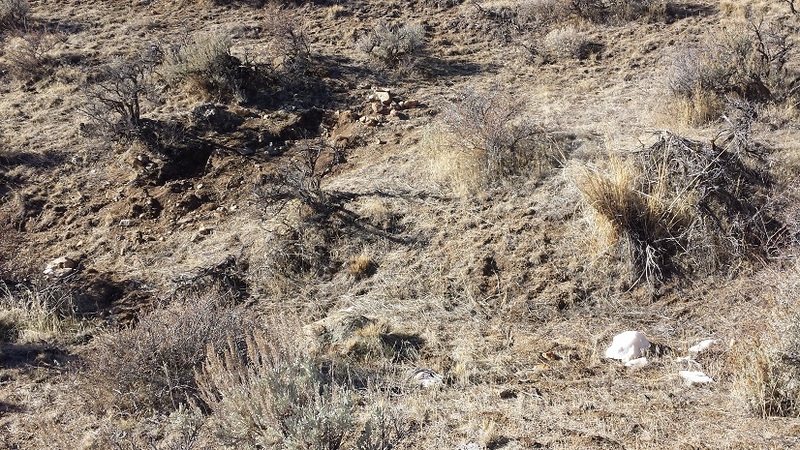 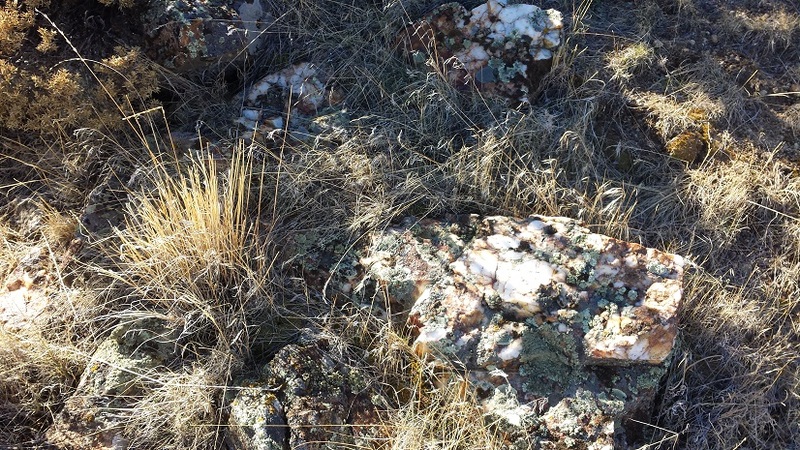 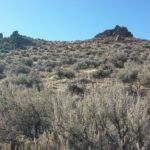 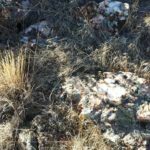 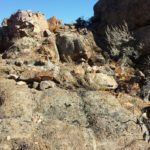 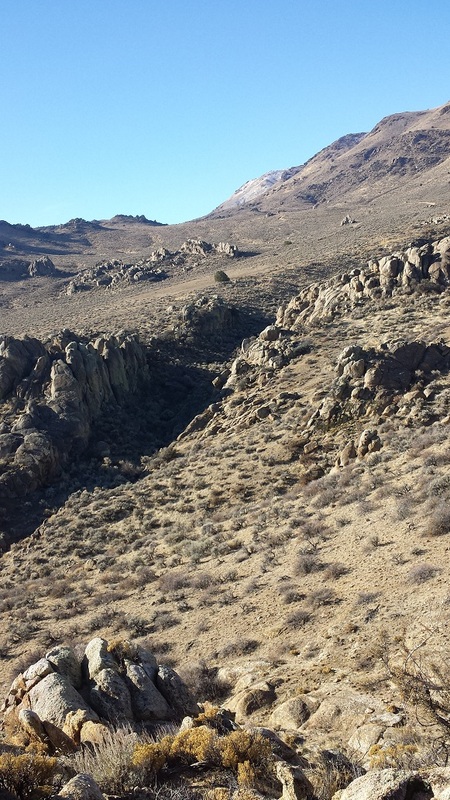 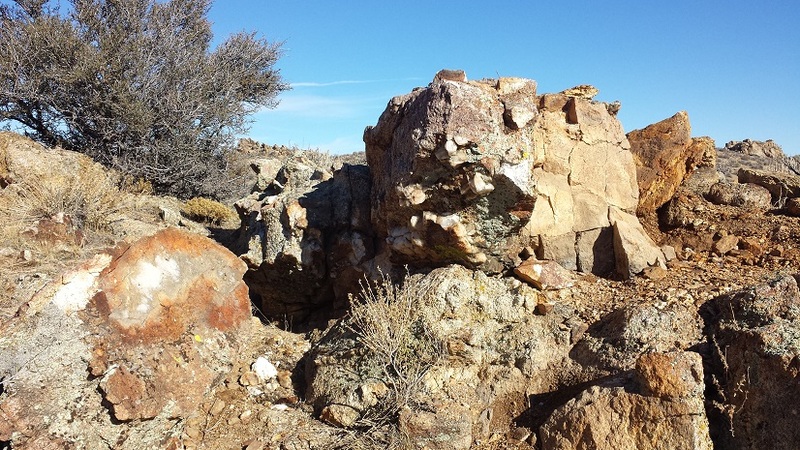 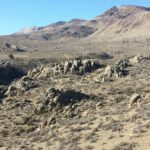 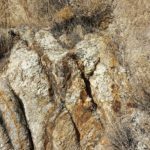 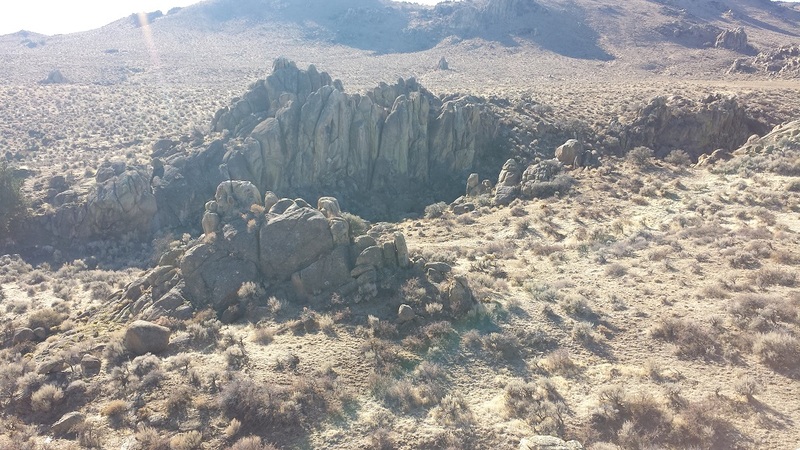 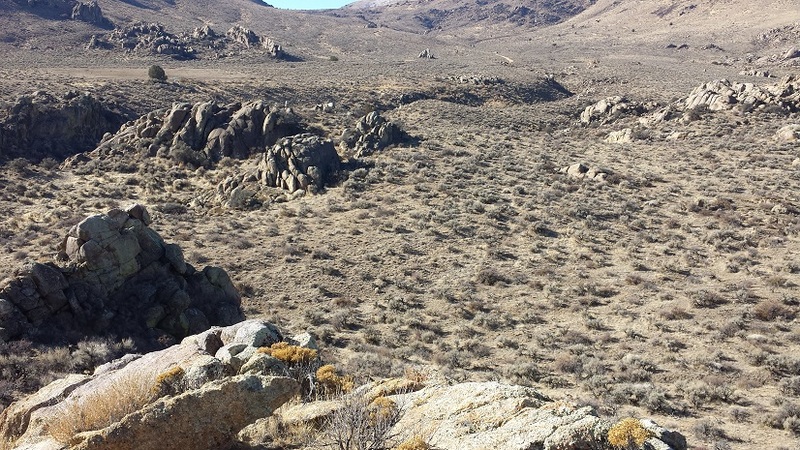 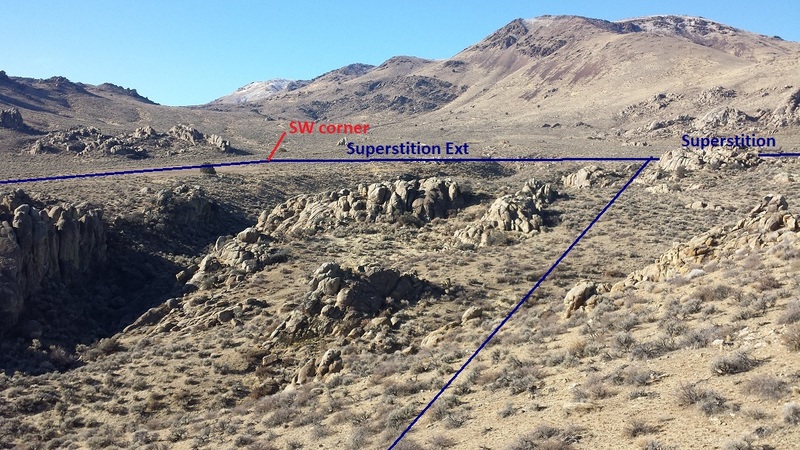 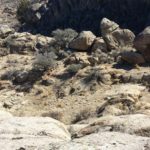 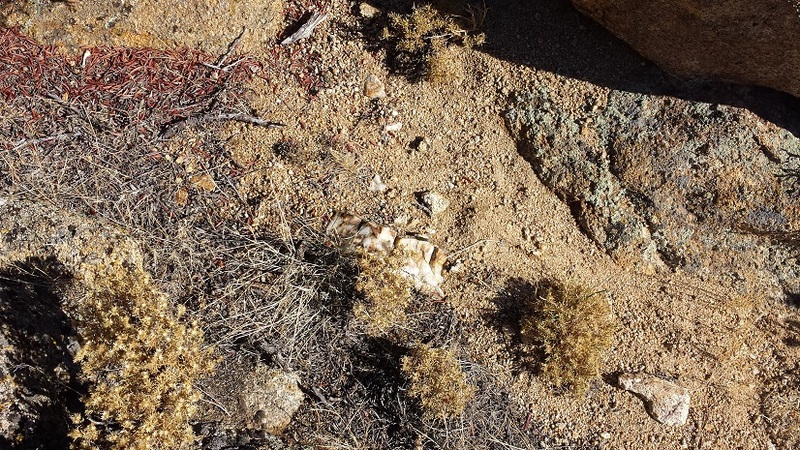 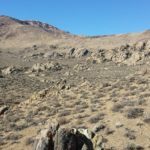 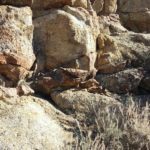 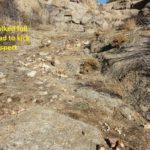 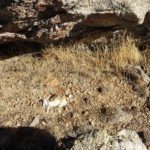 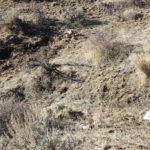 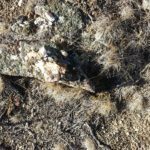 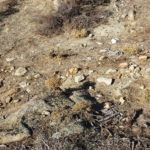 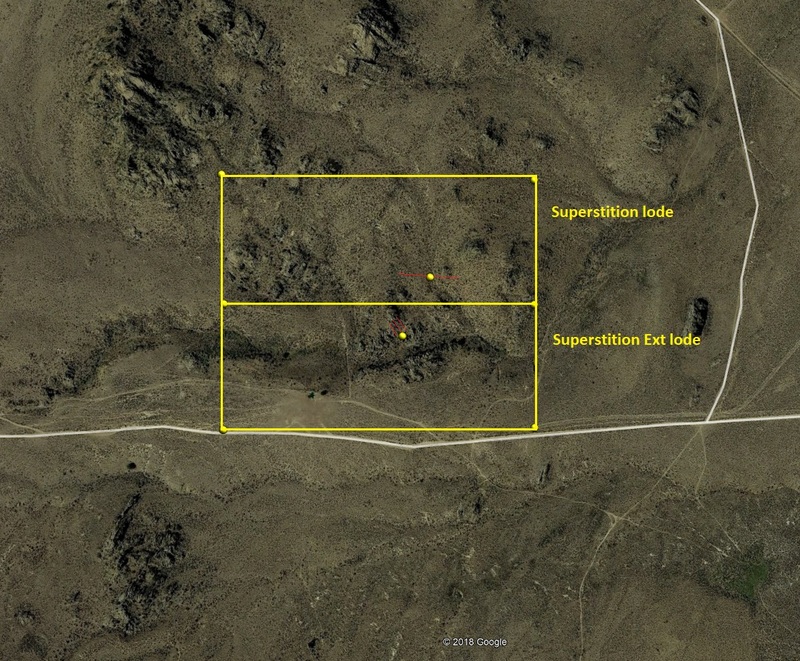 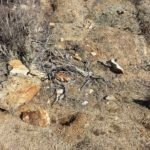 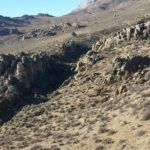 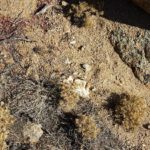 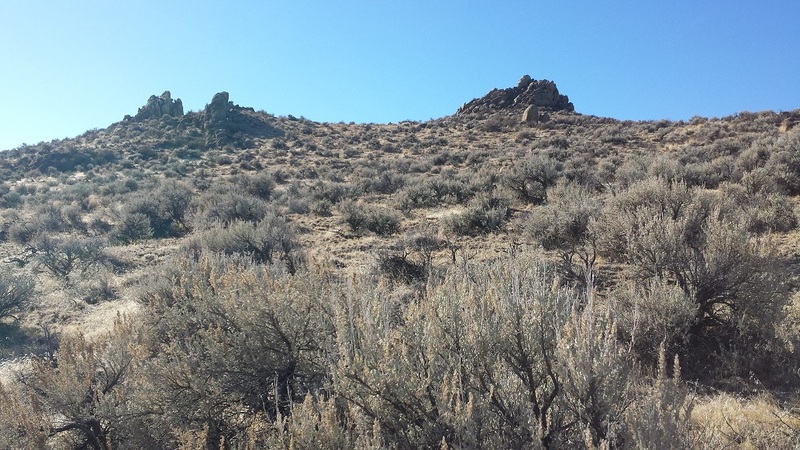 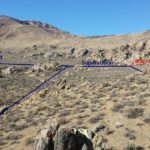 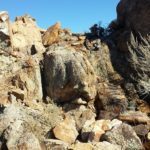 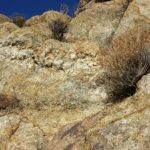 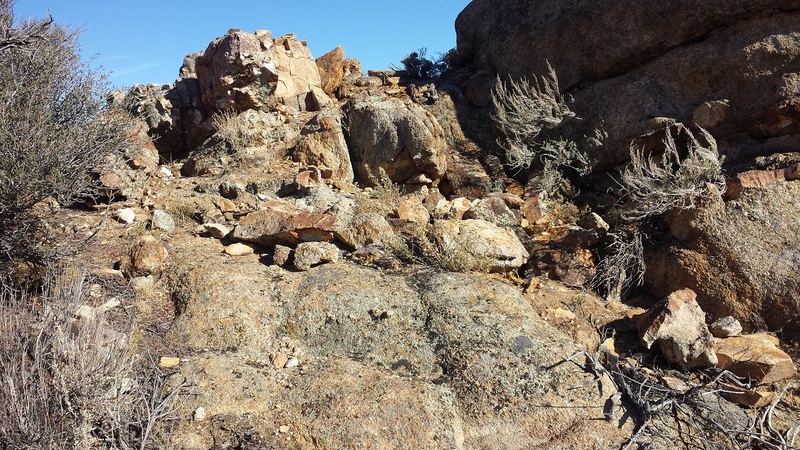 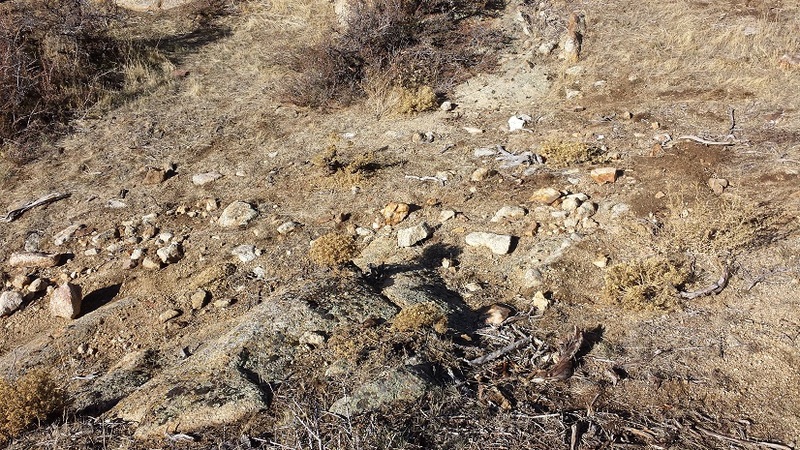 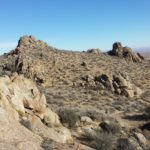 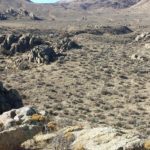 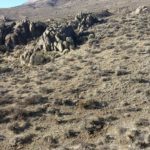 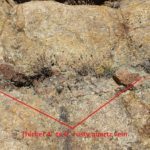 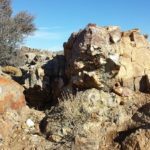 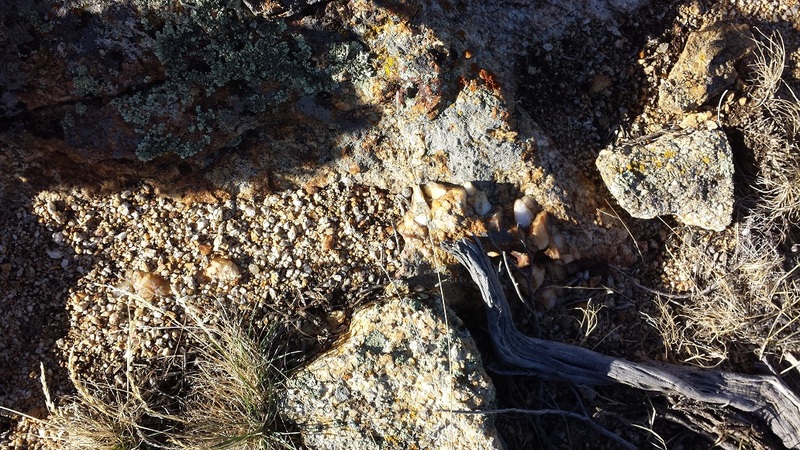 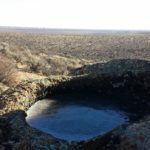 These two lode mining claims sit on the Murphy side of War Eagle, and at a lower elevation of 3900 feet, they are ideal for early spring all the way through late fall to get in and do some work. 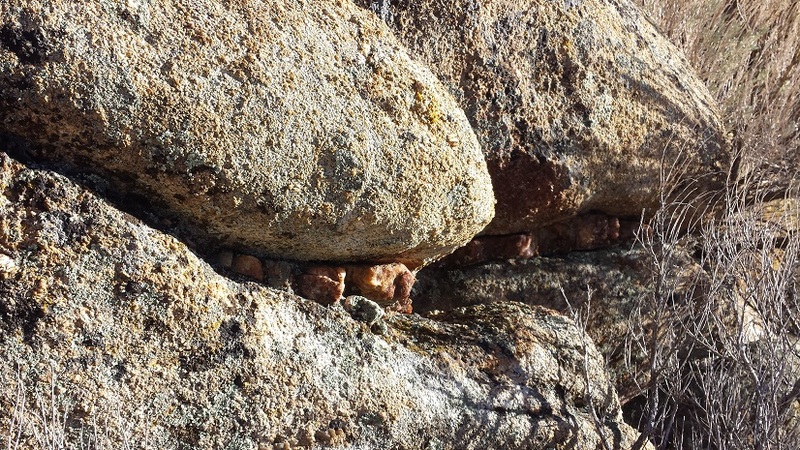 Yet even in dryer winters they are accessible intermittently through the winter. 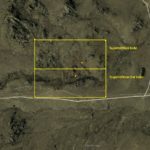 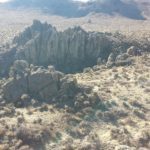 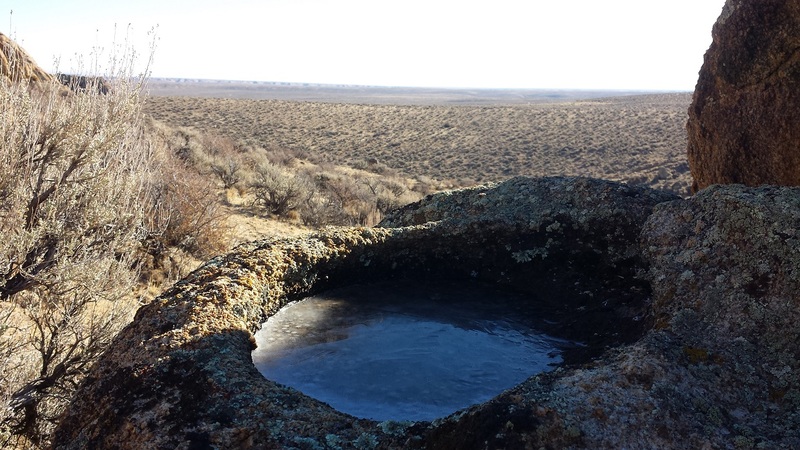 These are about 45 minutes out of Nampa, so quick easy sites to access, and as these claims sit on BLM land, it makes it easy to get an operations set up in. 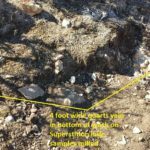 Aside from the little bit of scratching the surface that was done when taking these samples, the ground is in virgin condition. 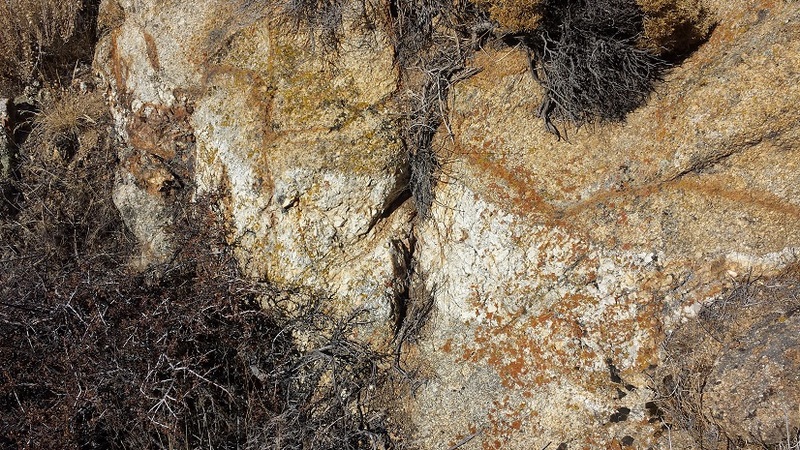 These claims will be sold together, as they run off the same vein structure. 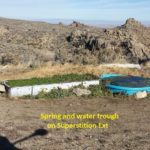 $3,750 for both Superstition & Superstition Ext. 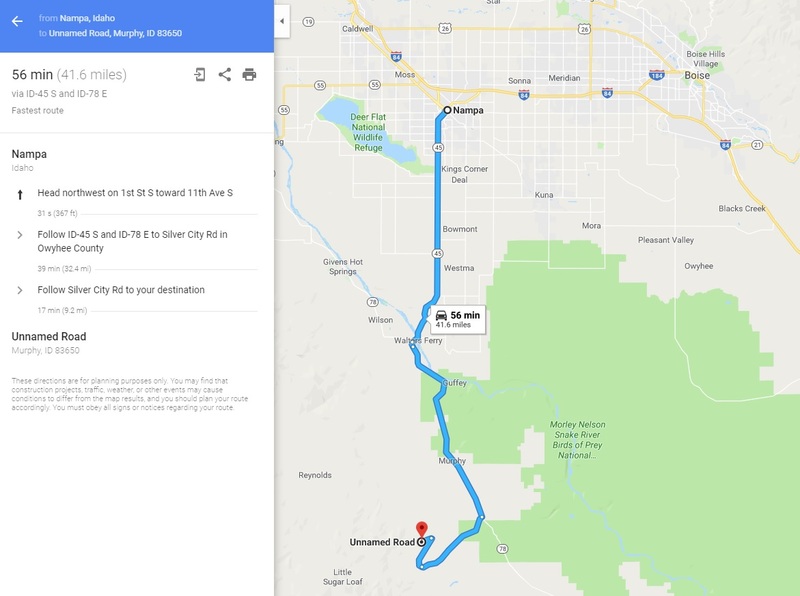 Driving Directions: From Nampa, travel south on HWY 45 approximately 14 miles to the HWY 78 junction, road will naturally curve left (southeast) onto HWY 78, head southeast on HWY 78 to approximately 4.5 miles past Murphy to the Silver City turnout, turn right heading southwest on the Silver City Road for approximately 6 miles (to major switchback and large parking area). 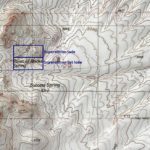 Turn right on BLM access road. 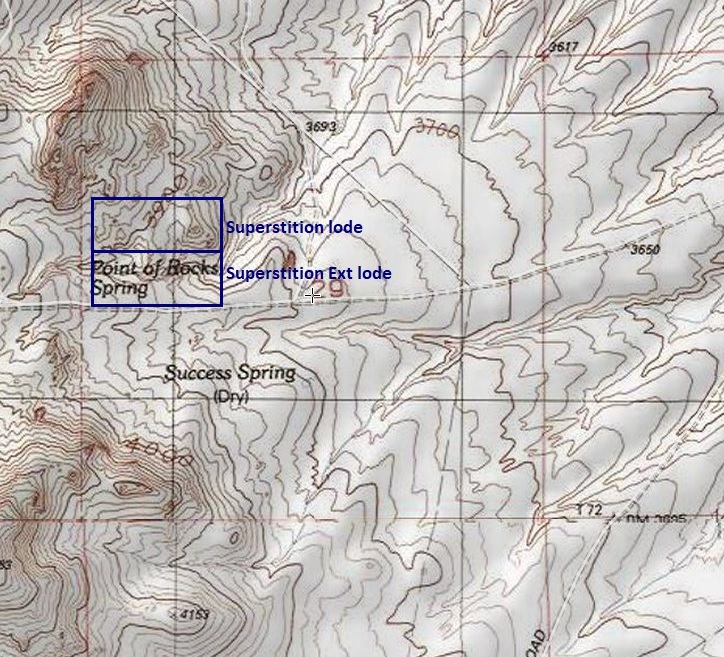 Stay on this service road for 2.5 miles to fork, turn left at fork. 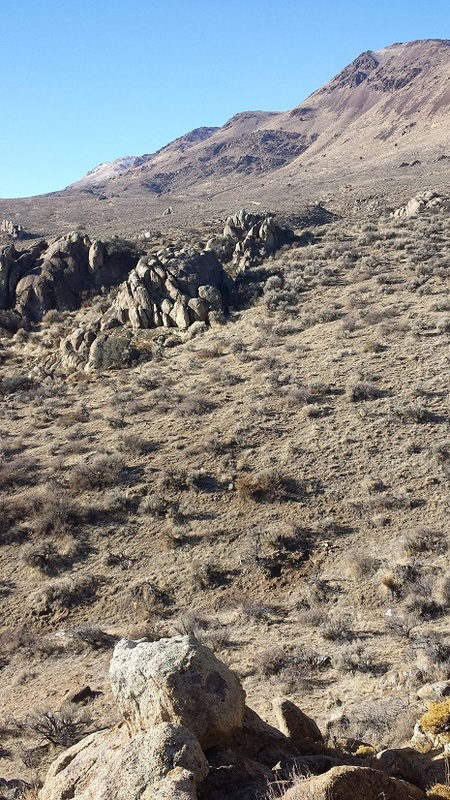 At about 0.9 of a mile the mining claims will be on the right. 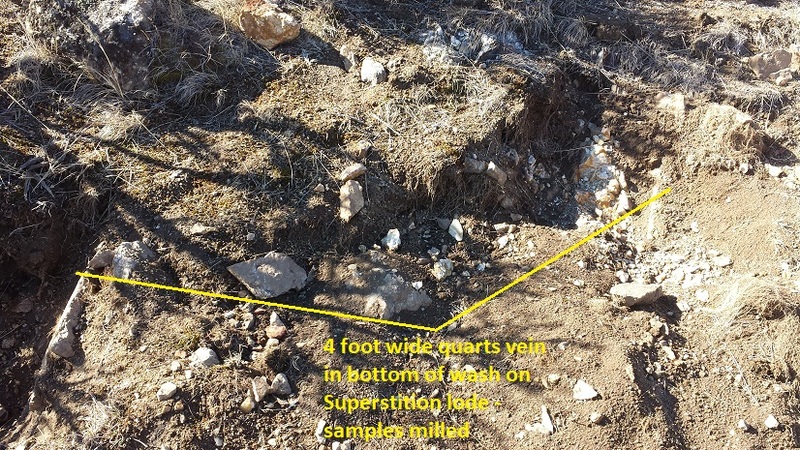 You will see the SE and SW corner markers to “Superstition Ext” within a couple feet of the road. 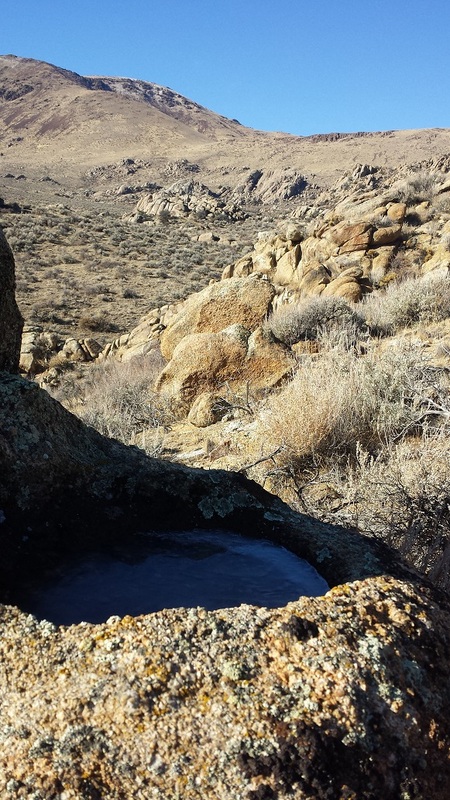 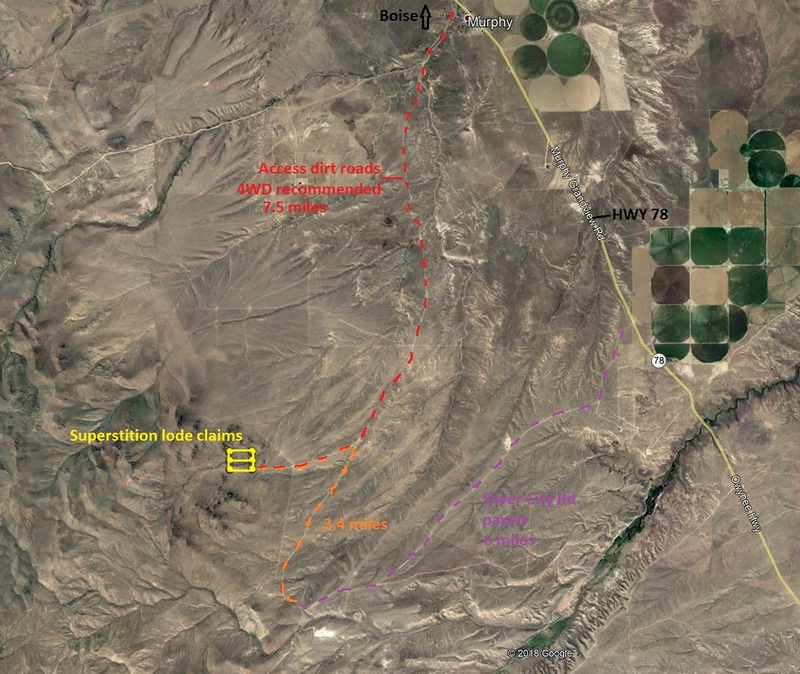 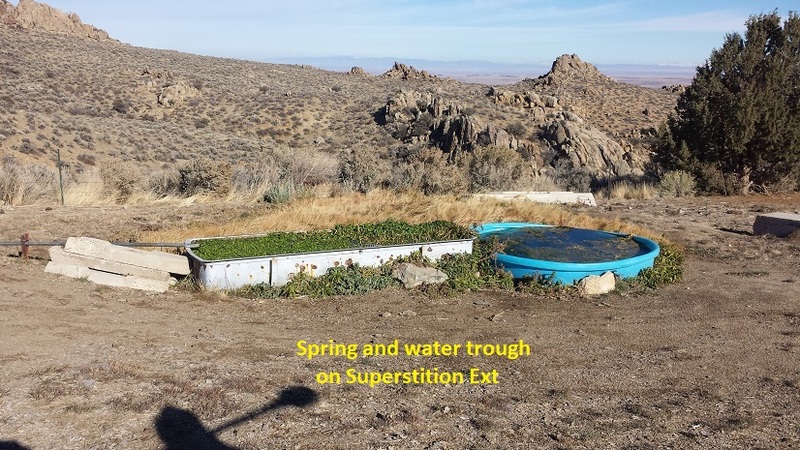 The water trough at the spring is on the “Superstition Ext” lode claim and about 450’ from the SW corner marker. 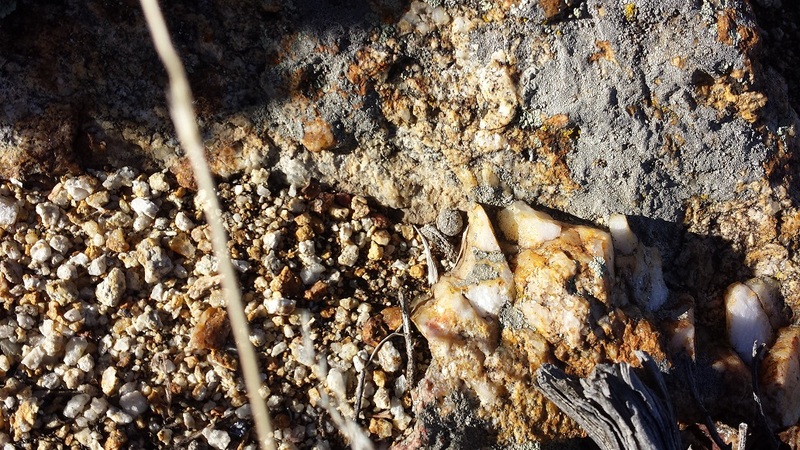 There is an alternate route into the mining claims: While traveling southeast on HWY 78 approaching Murphy, make an immediate right onto Rabbit Creek Rd. 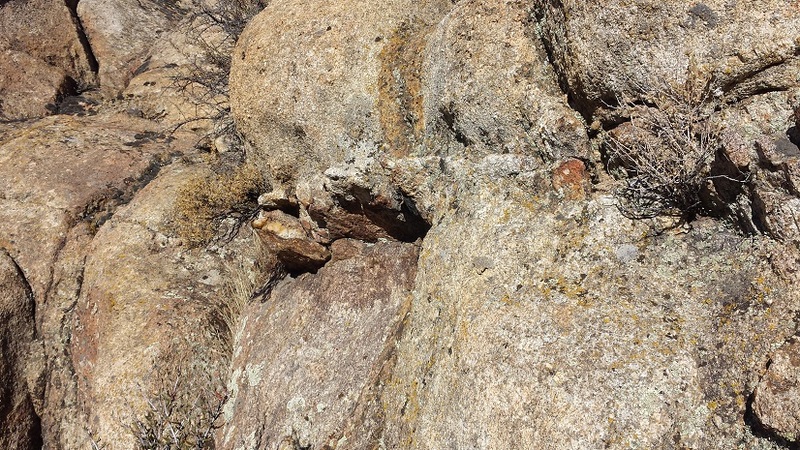 (which is before the bridge as you enter Murphy). 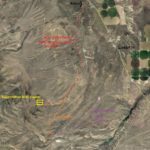 Stay on Rabbit Creek Rd. 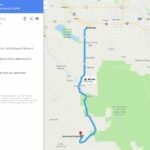 for 1.0 mile and make a left onto Old Stage Road. 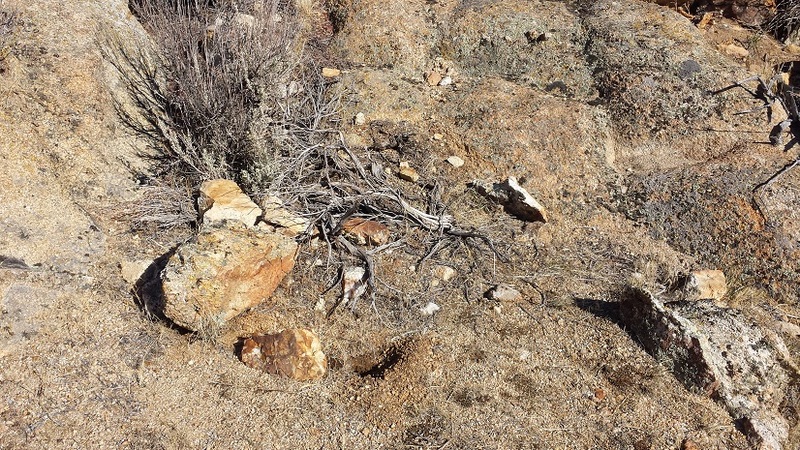 Stay on this for approximately 6.5 miles until you reach the mining claims. 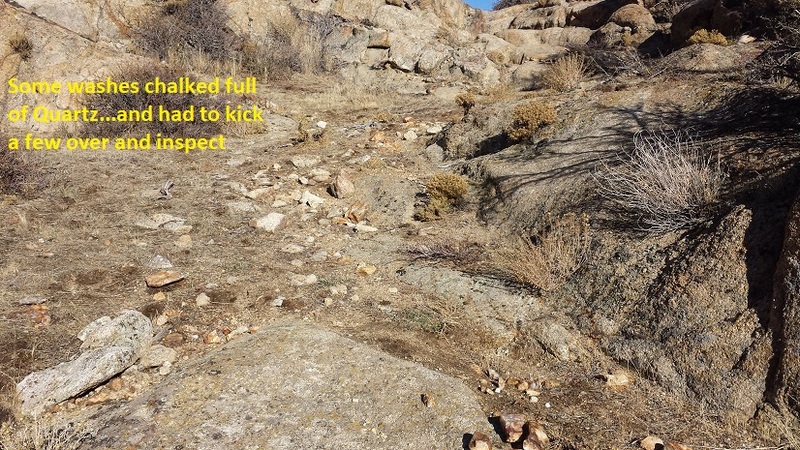 This is a slower route as the road is rougher, and would recommend 4WD vehicle. 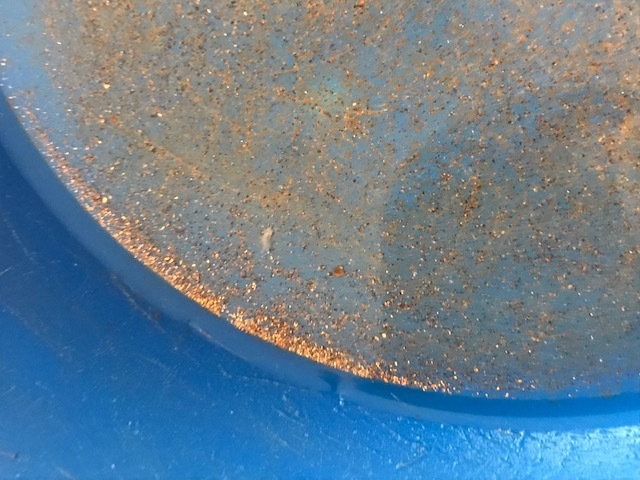 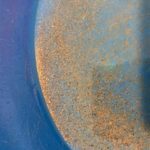 As mentioned, the washes showed good visible rough chunky gold from panning out material (just like what you would expect to find that close to the source), with visible loose quartz scattered throughout. 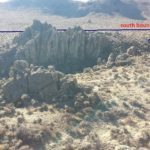 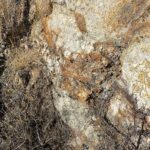 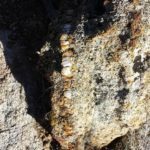 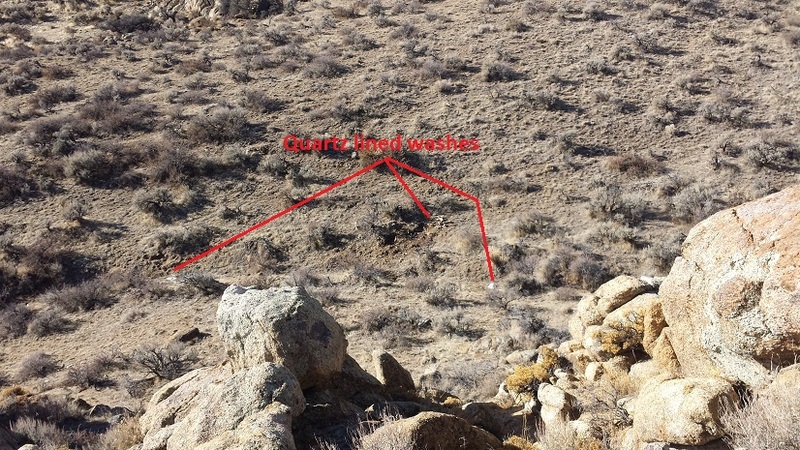 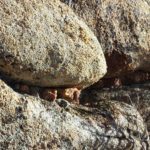 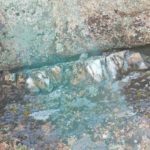 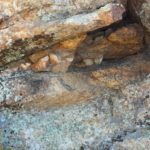 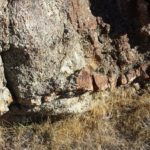 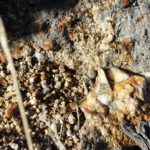 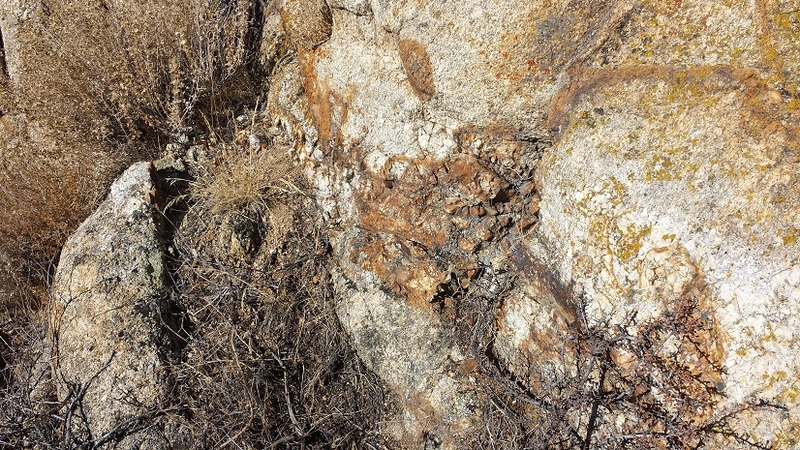 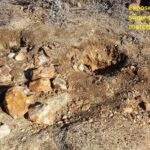 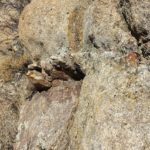 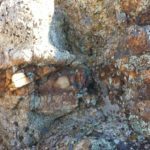 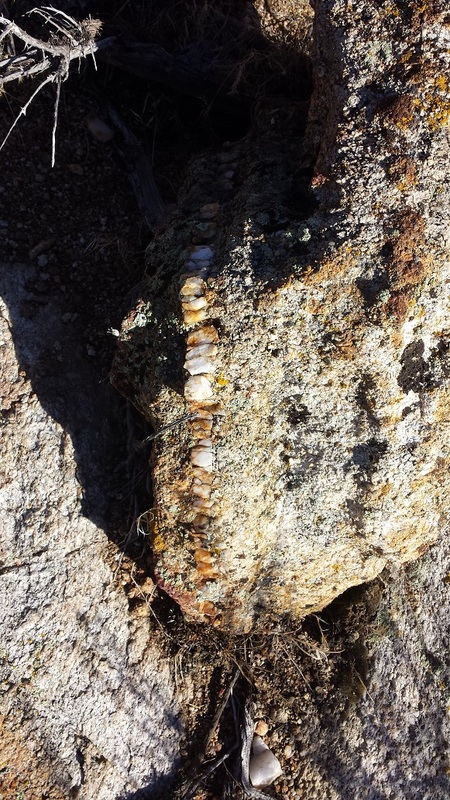 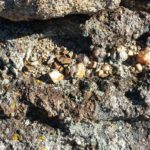 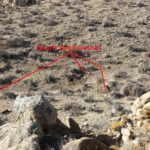 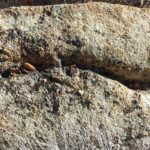 A couple hundred pounds were extracted from the visibly exposed veins on the surface of the outcroppings in two different locations. 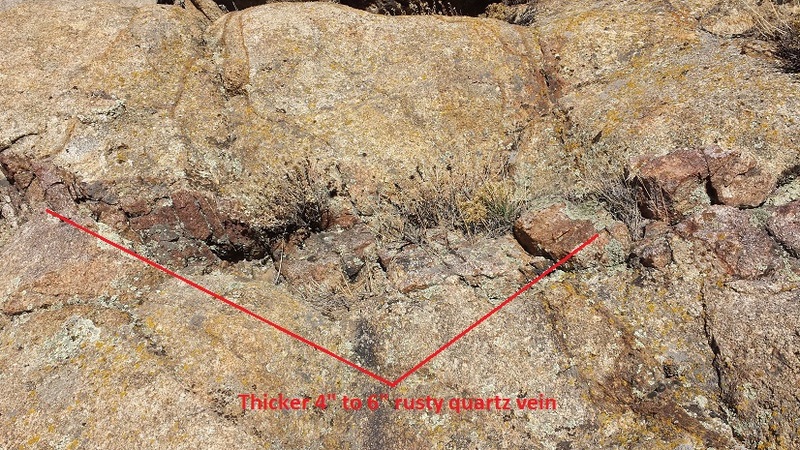 One of these veins is on Superstition Ext, roughly 6” to 8” thick, with rust stained granite abutting, and rust color interlaced through the quartz. 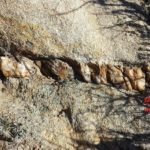 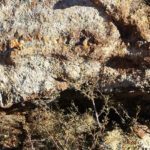 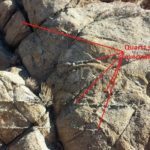 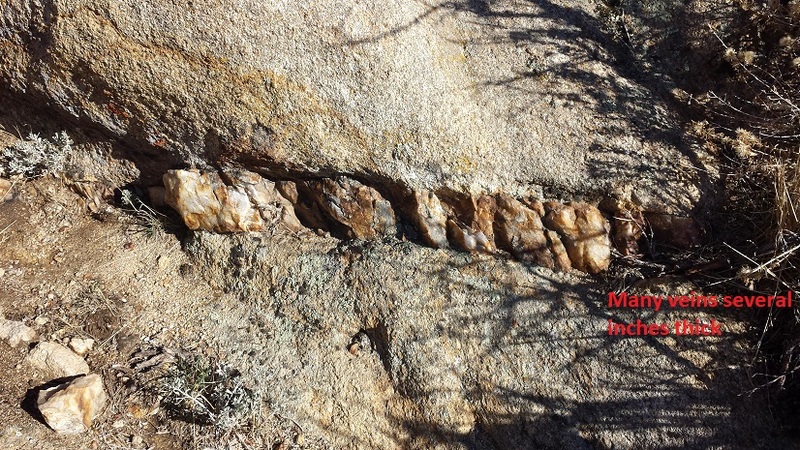 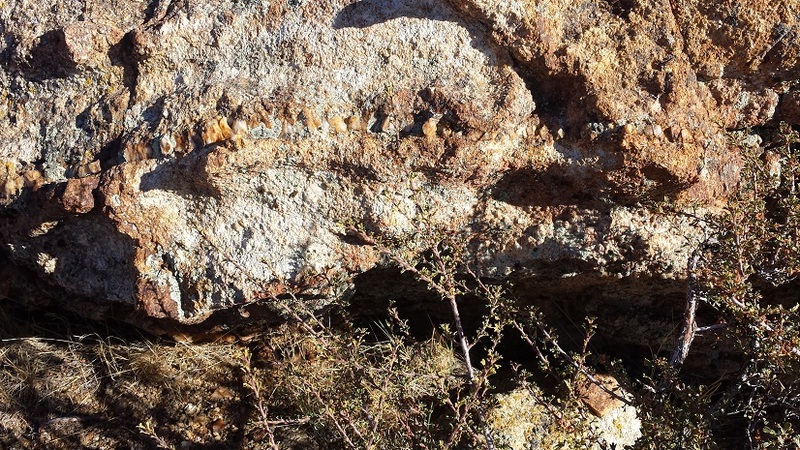 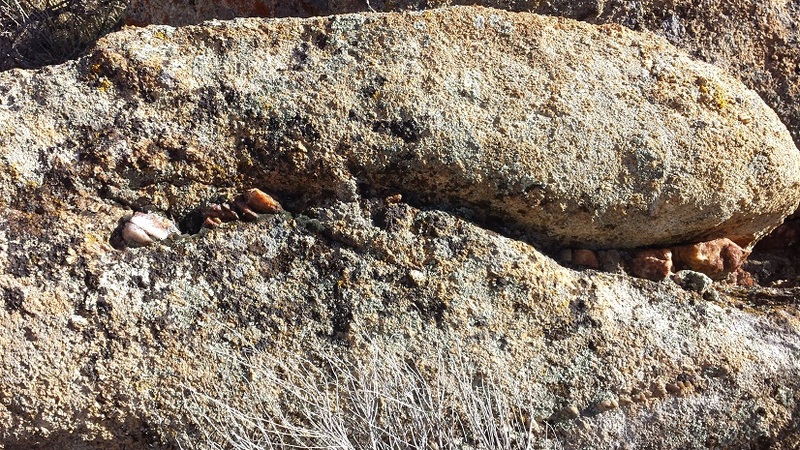 The vein on Superstition lode adjacent to the wash, with the quartz vein at an impressive 3 to 4 feet width where the sample was pulled. 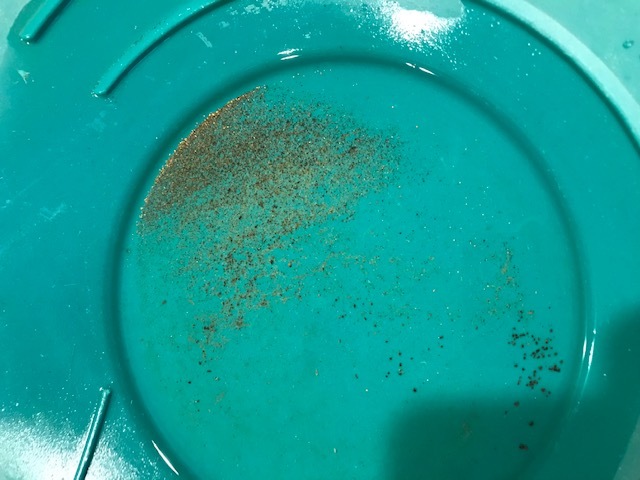 Of which, one sample (random tablespoon) of material from each location were sent in for assay (see results below), which each showed positive for both gold (Au) and silver (Ag) in the specimens. 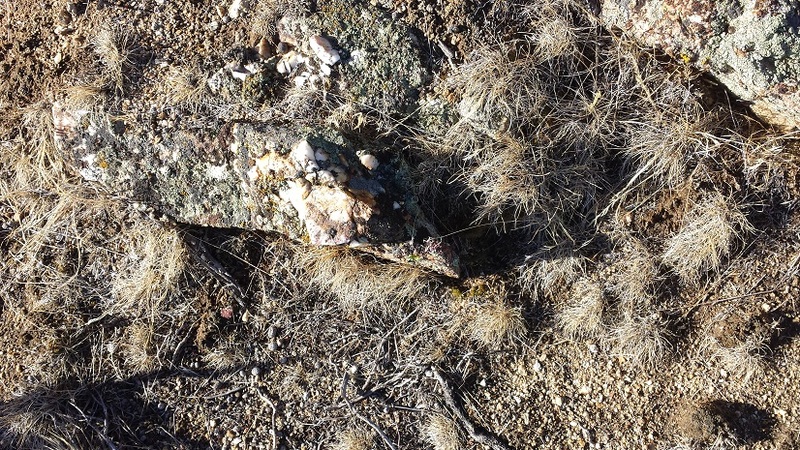 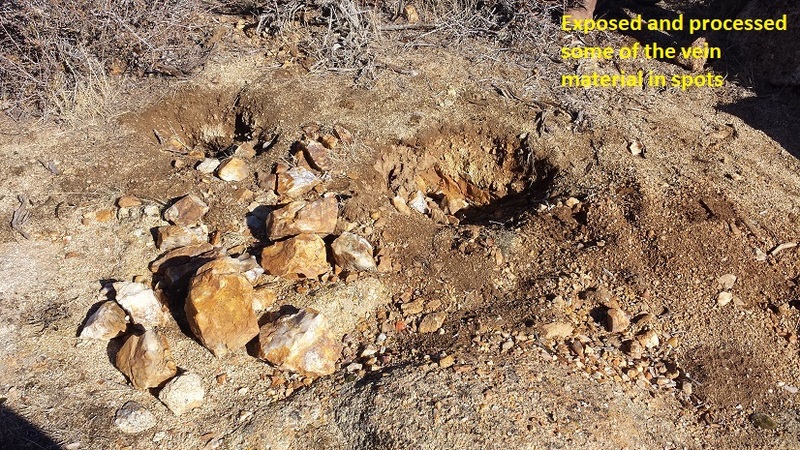 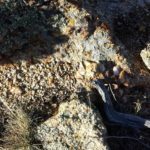 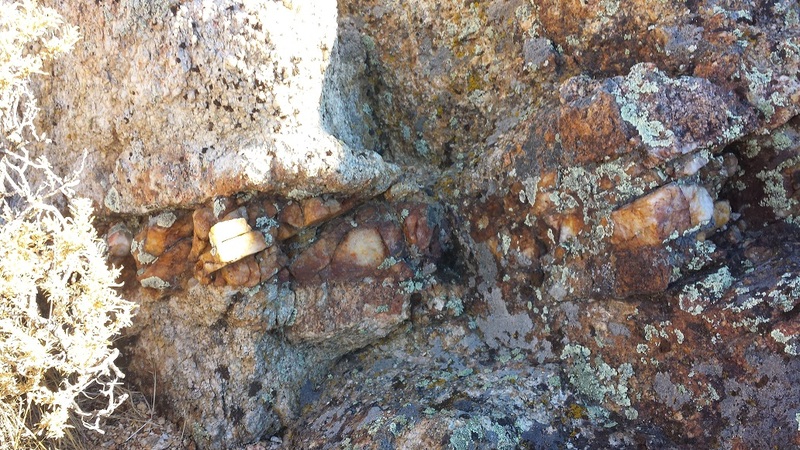 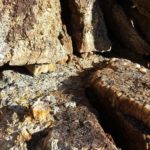 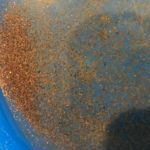 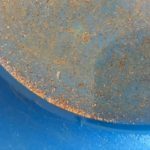 But just like with placer mining, and the test samples being so small and the few that were run, “Assays only paint a small picture” ~ Aaron Weiner – Geological Survey So the couple hundred pounds were crushed and sluiced, and both vein structures showed good amounts of freemill gold from the results. 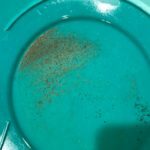 These pictures was the results from crushing and panning out the vein material.